Amy is faced with a horrible decision--stay on Earth with her boyfriend and friends and recognizable life or be frozen with her parents and sent on a spaceship to a new earth-like planet in the hopes of being awoken 300 years later. Amy chooses to go with her parents and endures the painful freezing process, only to have something go wrong and be conscious in her paralyzed body for centuries. As if that isn't enough, Amy is accidentally awoken 50 years ahead of her parents and must contend with a vastly different life aboard the ship. The only bright spot is a boy named Elder who seems to actually care about her. Elder is in training to one day rule the people on the spaceship. When he meets Amy he begins to question everything he's learned about Sol-Earth and everything he believes about his life on the spaceship. The two of them together investigate who is behind attacks on other frozen people, as well as why the current leader Eldest is lying about the history of Sol-Earth. The story is told in chapters alternating from Amy's point of view and Elder's point of view. It's exciting and gripping and satisfies readers eager for dystopian stories as well as science fiction fans. I read the book not knowing it was the first in a trilogy. I was satisfied with the ending of the story although I can see the "need" for more closure provided by the next books. 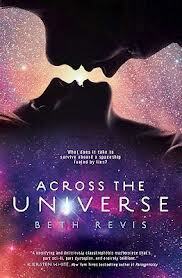 Across the Universe is a thrilling adventure with science fiction, mystery, and romance mixed in and well worth the read--632 pages flip by in no time at all. Wonderful review :D I have this book sitting on my shelf, it's simply tantalizing. I would dig into it but I'm saving such a treat for a 2012 TBR reading challenge for all novels that are 2011 and down. But when I do start the book I know I'm in for a treat!